"This way Luke !" - "No, that way Wedge !" 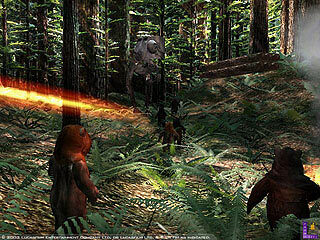 Don't hurt the Ewoks !! 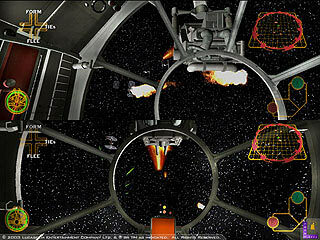 Star Wars Rogue Squadron II: Rogue Leader has been one of the most acclaimed GameCube game, at least, for a while; precisely from the time it was first shown, until it was played in its final version in people's living room. Then, opinions kind of... changed. Many started to realize they had been fooled, fooled by a formula yet so old and so common in video game: famous license plus great graphics (minus decent gameplay) equals bad game. Of course, they had been so absorbed by the first part of the equation, they had failed to see the warning in brackets, and the outcome. Even we, at Samurai Nintendo, got fooled, sharing the general enthusiasm when playing the game for the first time. Afterwards though, when we finally reviewed Rogue Leader after quite a long, painful experience with it, we had time to figure out how bad it was. Unlike a game such as Resident Evil 4, which plays equally well as it looks good and is skillfully constructed, Rogue Leader appeared to be a very difficult game, with extremely bad gameplay and a considerable lack of freedom. Its only advantage was to make us realize how great Starfox games are. 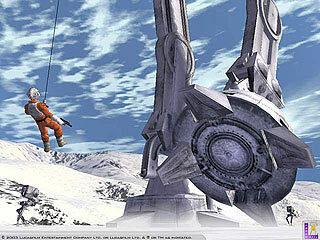 Most people had been so bitterly disappointed by this Rogue Leader, that it might have been actually one of the reasons why the GameCube performed so bad in the next months, some persons might have felt disgusted playing on a Nintendo console. 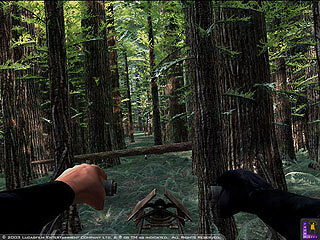 So when a new Star Wars game by the same Factor 5 developer was announced, the response was far from mass hysteria, especially knowing it shared so much in common with the original game. 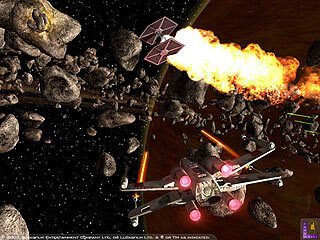 And when this Rogue Squadron III eventually came out, it flopped. However, the surprising thing is that Rogue Squadron II deserved more to flop than its sequel. One of these "you didn't expect that, did you ?" statements that we like to deliver in Samurai N. But the thing is, it's true, it really is. It must be difficult to believe because you must have heard pretty much everywhere how bad the game is, but most critics were just giving Rebel Strike the hard time they failed to give when reviewing Rogue Leader, which at the time was just praised blindly. The sequences by foot don't ruin the whole game as some suggest. If Rebel Strike is hardly a good game, just an average one at best, it's because it shares most of the same faults as Rogue Leader. With one difference however, the faults were much worse in the original title. What critics have been basically doing, is trying to correct their first mistake, by telling this time really what they think of the Rogue Squadron games. If they had to review Rogue Leader again, scores would be probably much lower, and possibly lower than for Rebel Strike, because that's what it actually deserves. Proof is, the Rogue Squadron have become so quickly two of the least remembered GC titles. 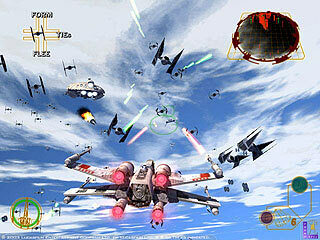 Everyone remembers Pikmin, Animal Crossing, Zelda, even less popular titles such as Kirby, Starfox, the Sega RPG, P.N.03, but as for the Rogue Squadron, they left the gamer's hearts a long, long time ago to go to a galaxy far, far away. When playing Rebel Strike for the first time, you're in for a really bad surprise: menus and the overall title design are just exactly the same as in the past game ! For my part, it was a first-time; never before did I see a sequel inheriting exactly the same design as its predecessor, the video footages for instance haven't changed a bit. No matter how much in a rush Factor 5 was to release this game before Christmas, this choice is really shameful. 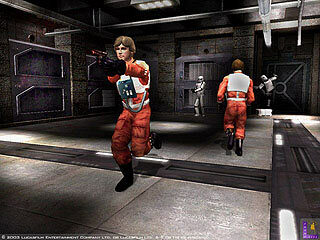 A significant addition to this third installment of the Rogue Squadron series was a cooperative mode, it became a prominent feature to sell the game, even though what you can actually play with another player is past missions from the first game ! This is also one decision that'll put a reprobrative look on your face. It definitely helped them to make the game faster and it adds up quite a bit to the lastability but no matter what: it does sound like a cheap solution (although Nintendo did worse with the multiplayer modes in the Super Mario Advance games). Besides, if you hated the first game as much as I did, it won't make any difference whether you can play it again with a second player, over the Internet or with DK congas, it still remains a bad game. But let's get back to the single player mode, after all that's where the new game is. Well, perhaps, you first need to go through those menus identical to the first game (even the command room for selecting missions is ! Oh my...). Then, you can finally start with a training mission, not far-off from the original training mission. It takes place in Tatooine's desert again with familiar environments, etc. 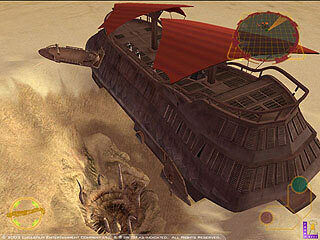 Missions are fairly different though, they are somewhat better than in Rogue Leader. More interesting, better paced, easier, this is a feeling which you find pretty much in the whole game when you compare with the original. 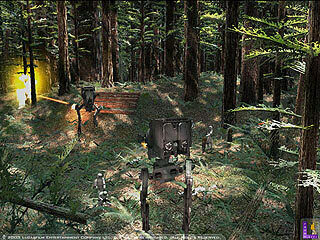 You will also give a chance to try out the most important new feature: third-person on-foot action. Funny to think one of the most elementary gameplay ability, walking, is here seen as something so new that it brings an all new dimension to the game. 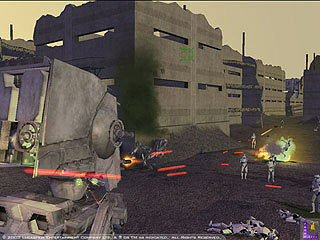 On-foot action in Rebel Strike will give you a good lesson though: that making a character walks and jumps didn't come off in video games effortlessly, that game makers worked hard to give it as good physics as possible and walking in 3D environments owes a lot to a long history of 2D movements. 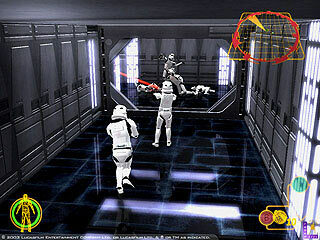 This is the lesson unwillingly given by Rebel Strike which offers a very poor display of movements in 3D environments. The characters move too fast, run too easily, they don't jump but bounce like rubber balls, they shoot like if their hand didn't obey their body and the camera work may give a hard time to players. This produces some pretty ridiculous situations, emasculating the power of classic Star Wars scenes. However, if it looks as bad as it sounds, it plays better and in no way ruins the game. On the contrary it helps to balance it better, gives it more variety like the missions inside a AT-ST or on a Speeder Bike do. Even if you're sick of flying in space ships, and it can happen quickly in a game made by Factor 5, you still can enjoy yourself at ground level. 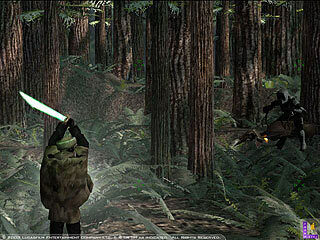 Revisiting Star Wars universe is not an easy task, especially after so many games on different systems. As expected, Rebel Strike's missions are in the continuity of Rogue Leader's, sure you can walk and pilot land vehicles and ride furry critters, but the core of the game hasn't changed, it's the same kind of missions with multiple objectives and scenes. The difference is just they are not equally boring, they are easier, sometimes more diversified, and hence better than in Rogue Leader. As for the cinematics, actual scenes from the movies which have been re-edited, they are short and not always very well cut, but they get the job done, especially when used like in the Death Star Rescue, to pace the level. 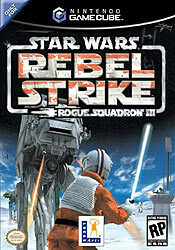 If you disliked Rogue Leader, chances are, you will dislike Rebel Strike too. But it's unlikely you'll dislike it as much, on the contrary, it might help soothe a sore past experience. Rebel Strike is a better balanced game with two major assets over its predecessors: accessibility and diversity. Simply speaking, it's easier and there are more interesting things to do. It doesn't compensate for the poor gameplay, Factor 5's everlasting trademark, but as Mary Poppins would say, it helps the medicine go down. However, what still makes this game really painful is this overwhelming feeling of deja-vu, actually it's more than a feeling, it's a all deja-vu game ! So much has been reused from Rogue Leader that you sometimes feel you're just playing an expansion, and as for the rest, you've been seeing it in so many Star Wars films and byproducts, games or others, that, unless you're a tiredness-proof fan, you get sick of all this pretty quick. Last but not least, another drawback with this game, which was also in Rogue Leader but we forgot to mention, is the very frequent disk access. Not only the scratching sound is irritating but it must spoil the GameCube at some point. 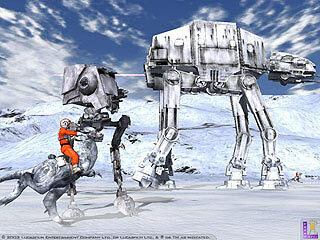 "X-wings, B-wings, speeder bikes, AT-STs, tauntauns. You'll have to master them all to save Luke, Wedge, Han, Chewie and Leia from Darth Vader and his Imperial forces in this return to the classic Star Wars� trilogy. 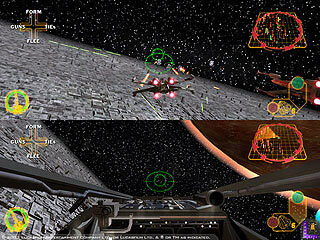 Multiplayer modes include endurance, capture-the-base, dogfights and co-op mode. Cinematic realism takes you to new heights as you climb out of your cockpit to battle the Empire on foot in this sequel to the best selling Rogue Squadron series." 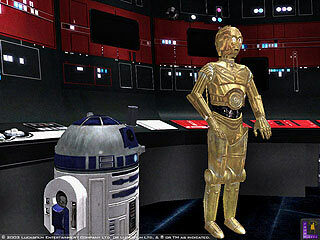 "- Visit famous places and characters from the Classic Star Wars Trilogy. - Engage in a variety of multiplayer modes including co-operative mode, endurance, capture-the-base and dogfights. - Get out of your X-wing and tackle the enemy either on foot as Wedge Antilles or Luke Skywalker or ride on speeder bikes or pilot AT-ST's. - Experience incredible graphics (HDTV Progressive Scan support), amazing sound (5-channel Dolby Pro-Logic 2 ) and split-timing controls."